The Rail Bridge over Mollison's Creek was constructed in 1889 by the firm of McDermott & Sons, on the Wandong-Bendigo Line, for the Victorian Railways. It is a 26-span, timber trestle bridge, with a timber deck that carries a single track over Mollison's Creek. The line was closed in 1968 and the track and timber sleepers have been removed. 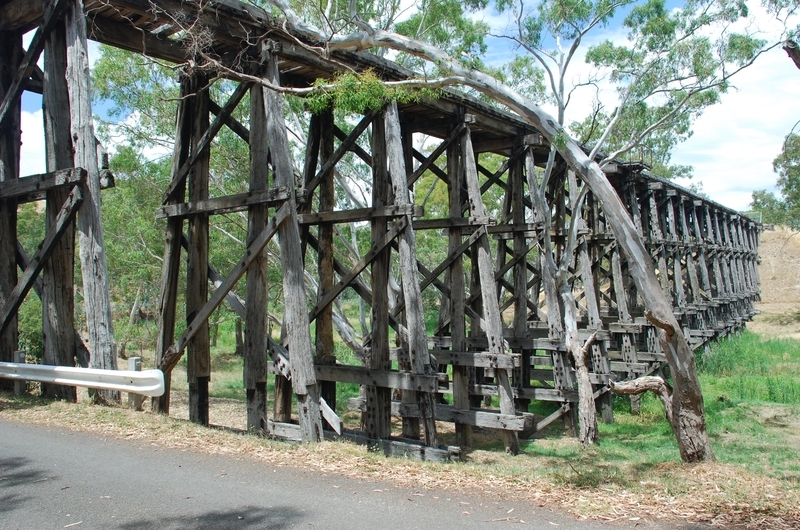 The Rail Bridge over Mollison's Creek, Pyalong is historically and architecturally significant to the State of Victoria. The Rail Bridge at Pyalong is historically significant as an important reminder of the Wandong-Heathcote-Bendigo Railway. The line was important as it was used to supply the Bendigo mines with shaft timbers, and for the transportation of wool and sheep (BPC, 1968). It is also an example of a rail bridge constructed as a result of the 'Octopus Act' of 1884. The bridge is architecturally significant as a notable example of timber trestle bridge construction, and demonstrates a distinctive and presently rarely used construction method, utilising the best qualities of native bush timbers. It is a typical and substantially intact example of a timber trestle bridge, using stay piles and timber longitudinal girders supporting the rail deck. 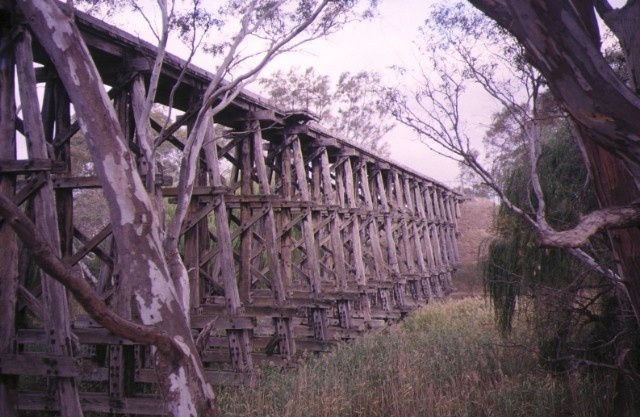 1.The entire bridge structure known as the Rail Bridge over Mollison's Creek, Wandong-Bendigo line, Pyalong, including the timber superstructure, bracing and piles, marked B1 on plan 602045 held by the Executive Director. 2. All of the land surrounding the bridge structure marked L1 on plan 602045 held by the Executive Director, being part of Crown Land. 1.All alterations are to be planned and carried out in a manner that prevents damage to the fabric of the registered place or object. No permit is required for works on the deck of the bridge, the incorporated superstructure which supports the track, for the maintenance of operational and safety standards, or for any emergency works relating to the substructure and superstructure of the bridge. The purpose of the permit exemptions is to allow works that do not impact on the significance of the place to occur without the need for a permit. Track works and maintenance to the bridge that does not affect the structure or appearance of the bridge do not require a permit. Maintaining the picturesque setting of the bridge should be taken into acount when considering a permit application.